AVID Jazz presents three classic Lionel Hampton albums, including original LP liner notes on a finely re-mastered and low priced double CD. 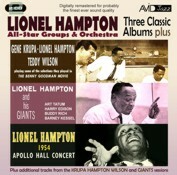 Lionel Hampton and his Jazz Giants!, and for the first time on CD Apollo Hall Concert 1954 and Krupa, Hampton & Wilson playing some of the selections they played in the Benny Goodman Movie. When we talk about super-groups perhaps naturally we think of the rock world in the 1970s and bands like Cream, Blind Faith and Crosby Stills & Nash. But if we turn our attention to the jazz world and look back a little further to the 1950s we will find all manner of musical super-group collections coming together for sessions, before departing for other musical adventures! Our trio of Lionel Hampton original albums reveal such a collection of jazz super-stars coming together to create great memorable music. Take a look at this line up for our first release Harry Edison, Art Tatum, Red Callender, Buddy Rich and Barney Kessel! Following a wonderful 1954 live concert at the Apollo Hall in Amsterdam with the Hampton orchestra we meet another fine super-group..Krupa, Hampton & Wilson may not sound as cool as Crosby Stills & Nash but just check out the music these guys played and you will be left in no doubt just who the real super- group is! All three albums have been digitally re-mastered for probably the finest sound quality ever!